Professor Darcy Ribeiro parade grounds (Sambadrome) are situated in Rua Marquês de Sapucaí, Cidade Nova, Rio de Janeiro. That is, the parade begins at Avenida Presidente Vargas, near Praça Onze, and ends in Rua Frei Caneca. In order to get to the Sambadrome and watch the Rio Carnival Parade, it is recommendable to find out the exact location of the relevant sector. At most two 500ml plastic containers with beverages and two items of food, such as fruit and/or sandwich. Objects made of polystyrene, bottles, glasses, firecrackers and fireworks are strictly forbidden. A discardable raincoat should be considered for the eventuality of a summer shower. Umbrellas are not a good idea, as they can easily get in the way of other people's view of the parade. At the Sambadrome there are shops and fast food kiosks in all sectors. Taxi - pre-determined taxi companies serve the even sectors and there is plenty of information about them during Rio Carnival. There is a tariff to leave the Sambadrome and the taximeter or an agreement with the passenger settles the journey to the place. 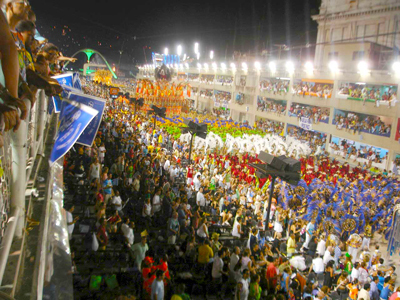 Subway - it goes uninterruptedly every-day to 11 pm of Tuesday, the last day of Rio Carnival, with intervals of 10 minutes. The getting off stop is always at Praça Onze station, no matter where from. Once outside the station, turn twice to your right and then walk straight ahead to Sector 2. To arrive at Sectors 4 and 6, turn on Rua Carmo Neto and keep walking until Av. Salvador de Sá. The Sambadrome can soon be seen and several signs show the entrance to the sectors. Taxi - special companies serve the odd numbered sectors as well, with fixed tariff. In any case, ordinary taxicabs take passengers to the Sambadrome charging what the taximeter shows or what has been agreed upon. For those who come from zona sul, the best route is through Santa Bárbara tunnel, and for those from zona norte via Rua Itapiru. In both cases the taxicab must go over Viaduto São Sebastião, which runs parallel to the Sambadrome. Right away the signs to the entrances of different sectors can be seen. Subway - either from zona norte or zona sul, the getting off stop is Central. From there, walk to the Sambadrome, a long stretch of approximately 700 meters, going past the schools' allegorical cars and the Terreirão do Samba. Bus - coming from zona sul or zona norte, it is important to make sure that the bus is going over Viaduto São Sebastião, as many lines change the itinerary during Rio Carnival. Limit of age doesn't exist for children's access to the Sambadrome, since they are with their parents.